I am really excited for the future of children's picture books! 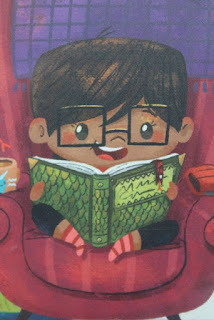 There are so many new and talented authors and illustrators creating amazing stories for us to read with our children. 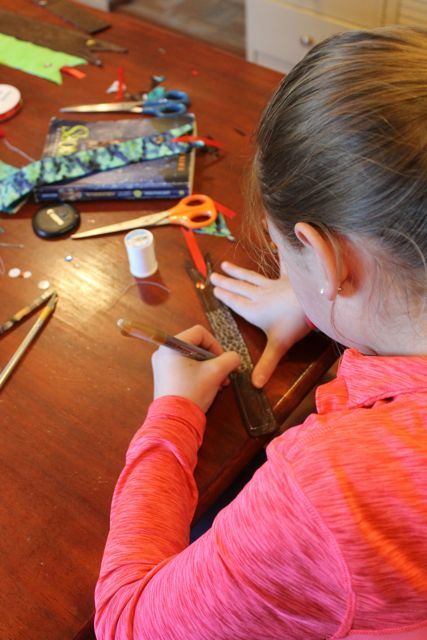 Our last three blog posts celebrated the birthdays of relative newcomers to the field of children's literature (Penny Parker Klostermann, Ame Dyckman, Julie Falatko). This week, we continue the trend with author and illustrator, Cale Atkinson. His first book came out less than a year ago and he has already followed it up with a second book. Plus, he has two more books scheduled for later this year! 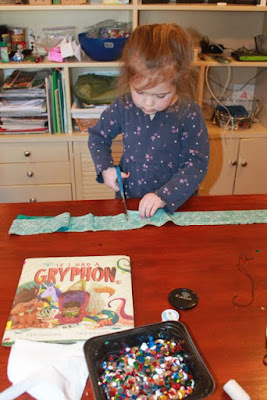 I am so excited to share with you a future superstar of children's picture books. 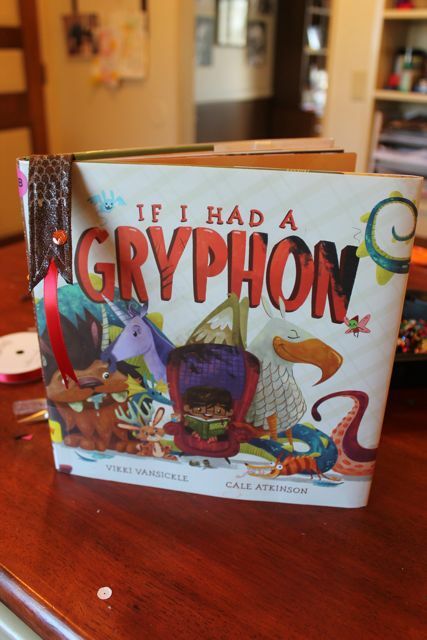 Cale Atkinson is the artist and creator of two picture books, his own To The Sea and If I Had a Gryphon by Vikki VanSickle. As a child, he and his brother "were always drawing, writing stories, or making movies." (Canadian Animation). In an interview with All the Wonders, Cale recalled making picture books with his father in elementary school, "He would write words and I would draw pictures with them. Or I would try to write my own." In high school Cale's interest turned to film making, but he made a huge decision not attend film school after graduation. Instead he decided to devote his time once again to his first love of drawing and storytelling. He said, "For the next five months I did my own version of schooling. Determined on developing my artistic skills I did nothing but practice, absorb art blogs/books/artists online and practice more." (Animation Insider). Cale's five months of hard work paid off. He made many connections within the industry and landed a job working for InLight Entertainment, a maker of children's video games. After InLight, Cale worked on his own before being hired by Disney Studios, where he worked for three years. Now, Cale describes himself as an illustrator/writer/animator. In addition to his picture books he has worked on a variety of projects including many stunning animated shorts. 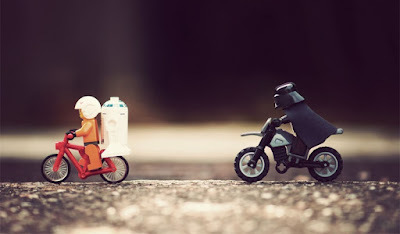 Lil' Red from cale atkinson on Vimeo. For Cale it is all about storytelling. He described his need to express himself, "So whether or not it is an animated short, whether its in a comic strip, whether its in a book. Whatever I can do to try to get these ideas and stories that are in me out. Picture books are a great way of doing that." (All the Wonders). Cale's first picture book, To the Sea, was published in June 2015. 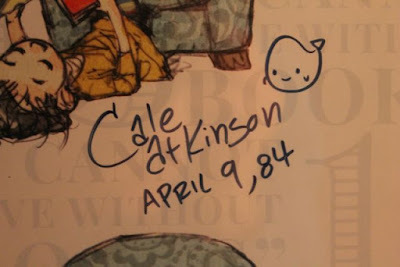 The book came to be published much like Cale's career as an artist and animator. He put in the hard work to make it happen. One day, he needed a break from a story he was struggling with and doodled a child in the rain with a whale. He admitted, "I don't know where it came from in my brain." (All the Wonders) But, there was something Cale really liked about the child being alone in the rain with the whale and decided he wanted to tell the story. He said, "I just wanted to make it from start to finish...and put it out there, maybe for free...or maybe self-publish." But, Cale didn't have to put it out for free or self-publish. He sent the complete book to publishers and it was picked up by Disney Hyperion! To the Sea is a book about friendship. 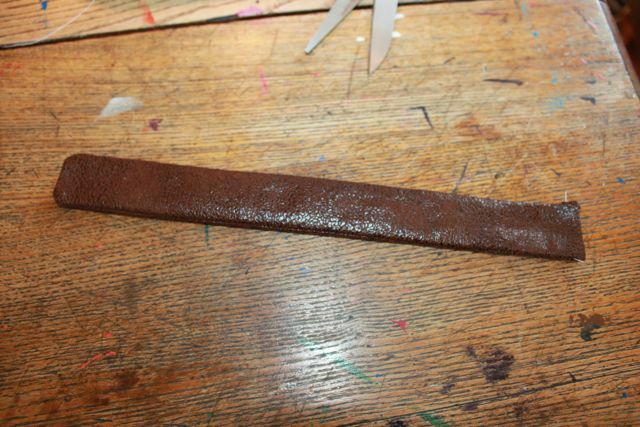 Tim is a quiet boy at school and many of the other children pay little attention to him. Sam is a blue whale who takes a wrong turn, ends up outside of Tim's school, and no one except Tim notices. Tim and Sam quickly become friends and Tim wants to help Sam get back to the sea. One of Tim's many ideas doesn't go quite as planned, but together they learn that true friends are there when you need them most. I was moved by a couple of the lines from To the Sea and thought it would be fun to see if I could make Tim and Sam out of Legos and create my own inspirational image. Here is what I came up with. I hope you enjoy them as much as I do. 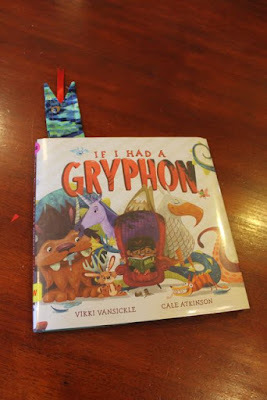 After reading To the Sea we read Cale's latest book If I Had a Gryphon by Vikki VanSickle and it inspired our birthday celebration activity. The little girl in this book got a hamster for a pet and after just a week she decides that it is not very exciting. 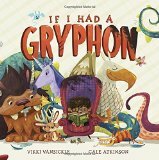 She imagines what it would be like to have the mythological creatures from her book as a pet -- a unicorn or a sasquatch or a kraken! She realizes that those creatures would be exciting to have as pets, but could cause some huge problems. Maybe her hamster is not so bad after all. I poured over the illustrations in If I Had a Gryphon and noticed that the girl has the coolest bookmark hanging over the edge of her book of mythological creatures. I zoomed in on the cover. 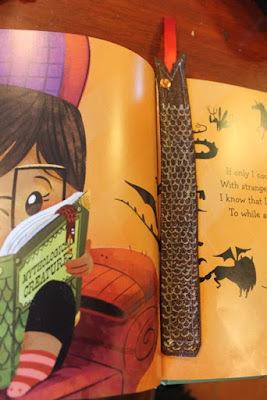 Do you see the awesome snake bookmark? 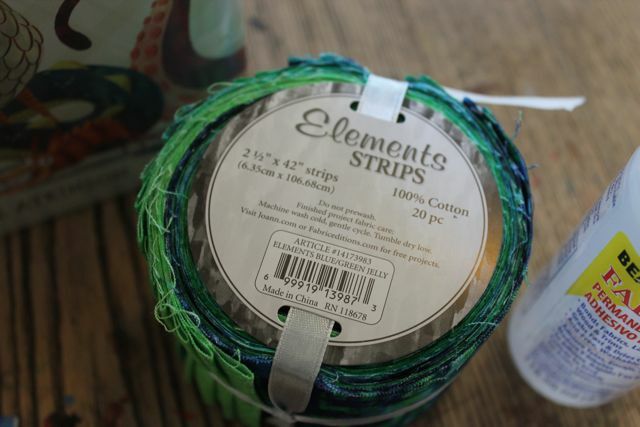 I went to Joann Fabrics and Craft store to seek inspiration for this project and I found everything I needed - sequins for snake eyes, red ribbon for a snake tongue! The best thing I found was this roll of cotton fabric strips in a variety of green and blue patterns. 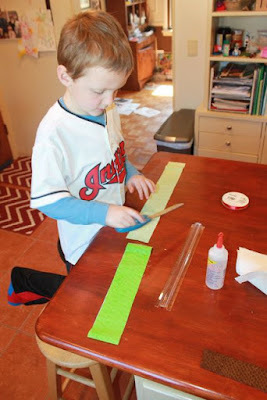 This roll saved us from cutting strips for each bookmark! 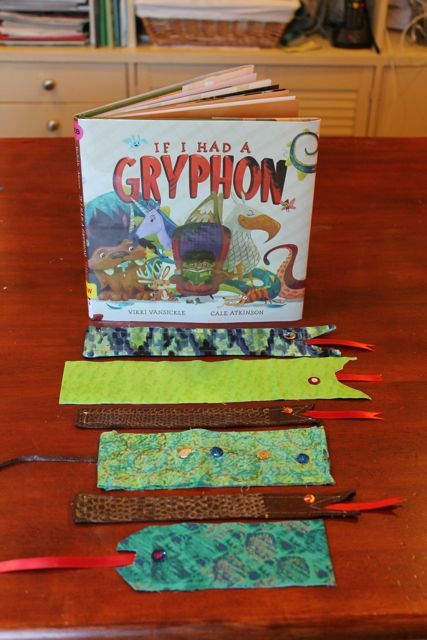 I laid out the strips on the table for my children to chose their favorite one for their bookmark. My son wanted his bookmark to be 12 inches long. He measured and cut two strips. My daughter didn't want help cutting her fabric. 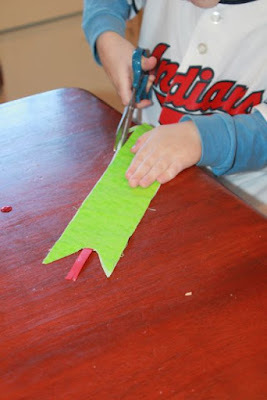 My son placed the two fabric pieces together and cut a triangle shape out of one of the ends to make a snake mouth. 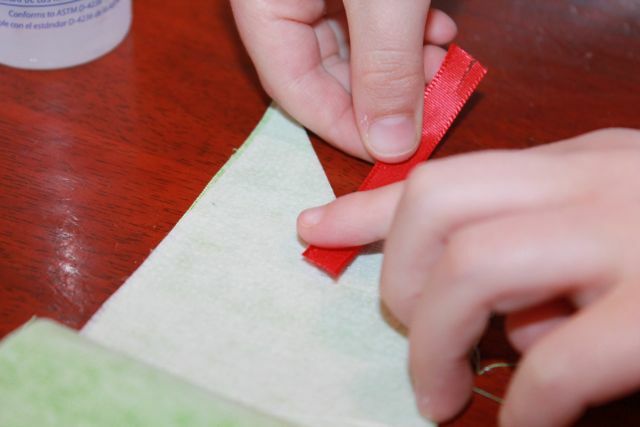 Then he used fabric glue to attach his ribbon for the tongue. 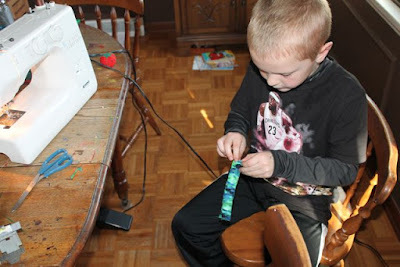 I asked him if he wanted to sew his bookmark using the sewing machine or use the fabric glue. He chose the fabric glue because he got to do it all by himself. He carefully pressed the two fabric pieces together. 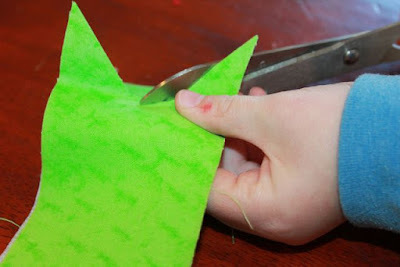 He trimmed the edges made the snake look neat. 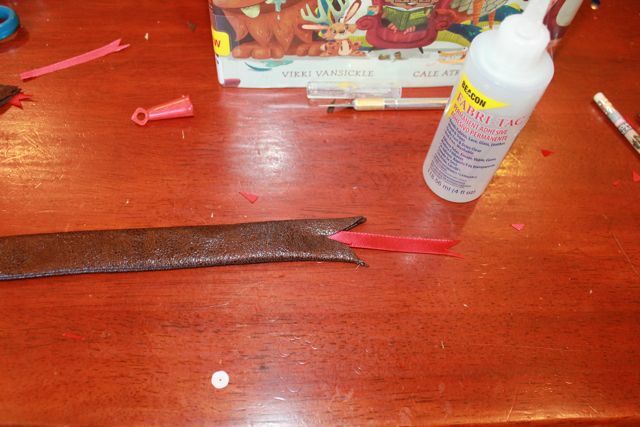 He used the fabric glue for the snake's eyes too. 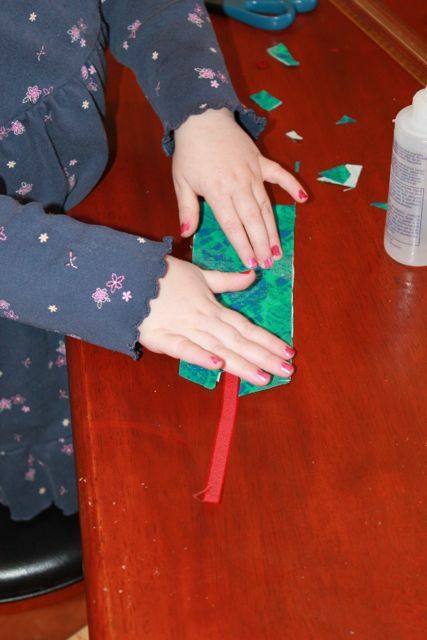 His sister worked hard on her bookmark. I prepared to make my bookmark while they were working. I found brown faux leather fabric to match the bookmark from If I Had a Gryphon. 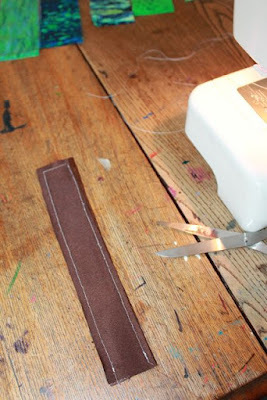 I chose to make the bookmark about 1 1/2" wide. 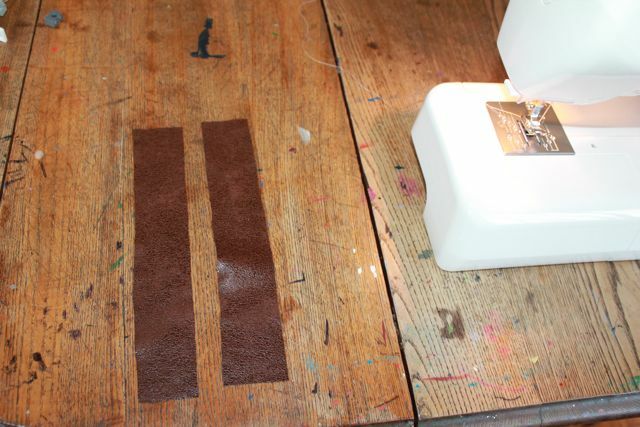 I laid the strips front to front and stitched along three sides, leaving one of the short ends open. 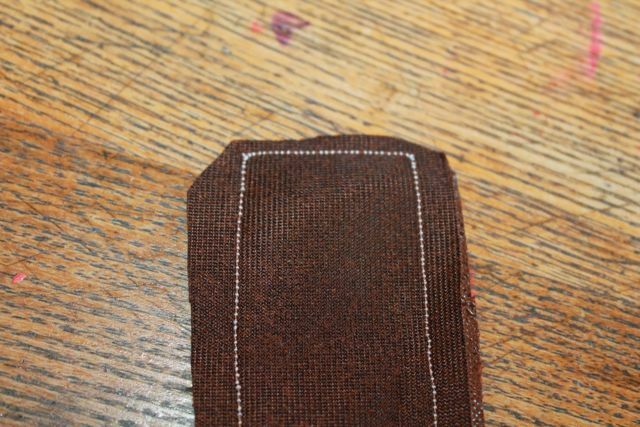 Then, I turned the fabric right-side-out. 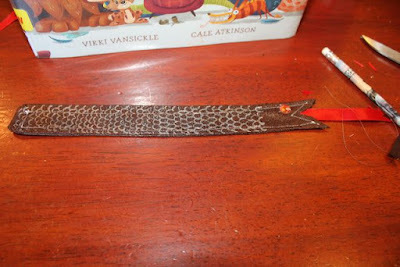 I cut the snake's mouth and glued the tongue inside. 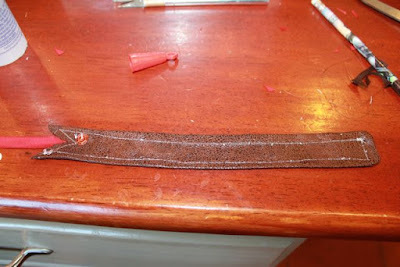 Then, I did a top stitch over the whole bookmark and hand-stitched a sequin eye. Lastly, I added scales with a gold Sharpie marker. The bookmark looks pretty close to the one from the book. My big kiddos came home from school and saw the crazy crafting going on in kitchen and wanted to make a bookmark too. 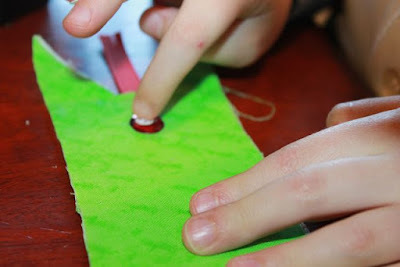 They wanted to use the sewing machine to sew their bookmarks. 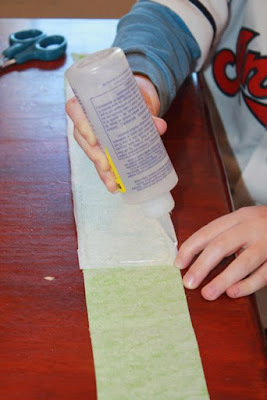 We added a layer of fusible interfacing between the two layers of fabric. 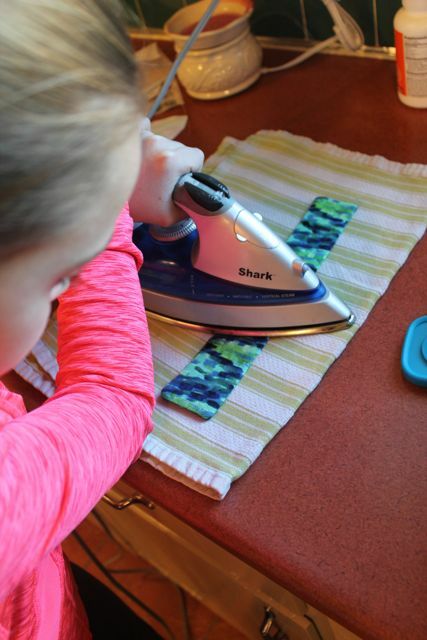 My daughter was excited to use the iron for the first time. 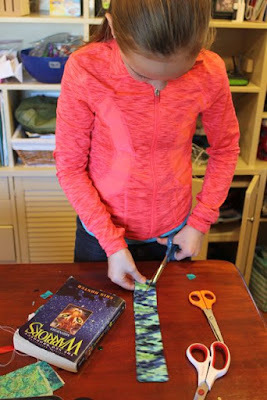 She measured to make sure the bookmark was the perfect size for the chapter book she was currently reading. 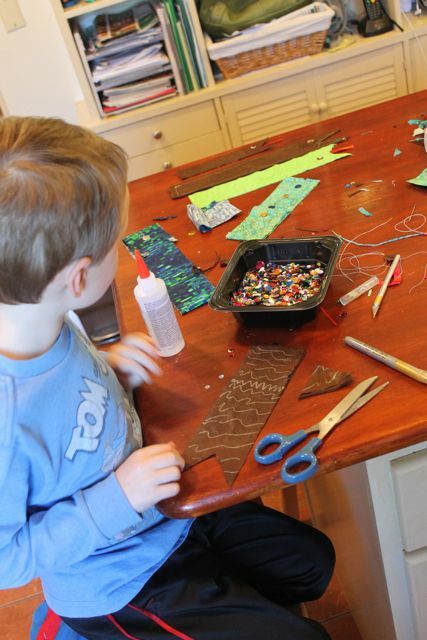 Meanwhile, my youngest son was still making bookmarks on his own! 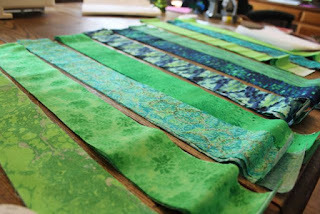 Just a few of our snake bookmarks! The bookmark looks perfect inside this fun book! My oldest son made one too! 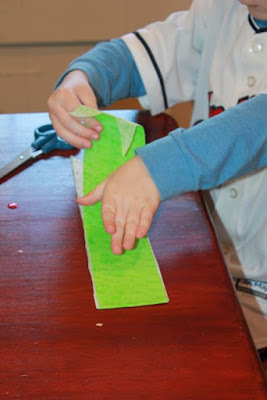 Here he is flipping the fabric right-side-out! 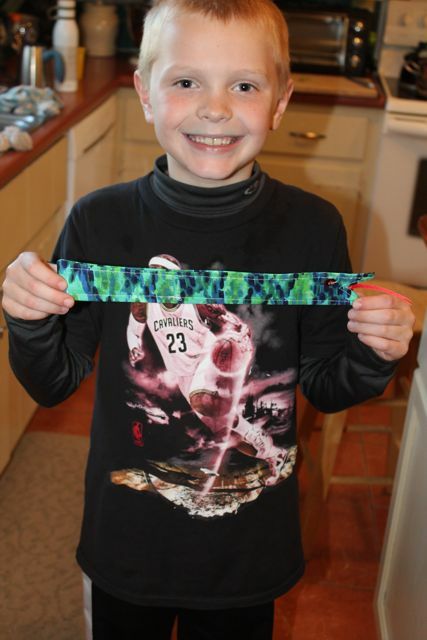 He was proud of his finished project! Cale! Thank you for sharing your birthday with us at the National Book Festival! We hope you have a wonderful birthday! We can't wait to read your upcoming books!! 3. 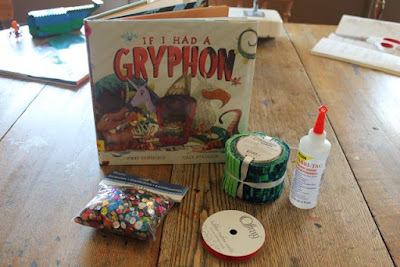 Interviews - Marvel, Animation Insider, Canadian Animation, KidLit Frenzy, Bird Meets Worm, Watch.Connect.Read. TO THE SEA - Book Trailer from cale atkinson on Vimeo.